​​​DALLAS – A 375,000-sf building that will serve as Southwest Airlines’ Leadership Education and Aircrew Development Center (LEAD) has topped out. 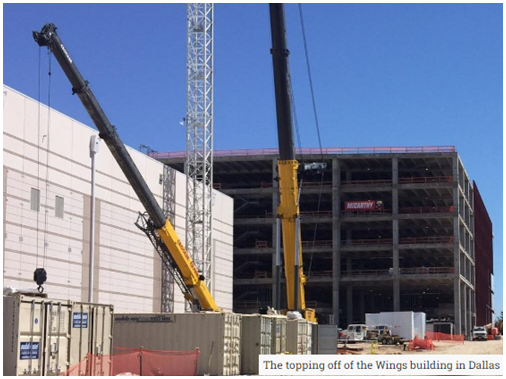 McCarthy Building Companies Inc. broke ground on the new development in May 2016 and is expected to complete the overall “Wings” project in first quarter 2018. This also comprises a six-story, 425,000-sf Southwest Airlines office building. The LEAD Center will house 18 flight simulators, one of which has already been installed. Built with a hardened structure designed to withstand the forces of an F4 Tornado, the Center is scheduled to start operation in 3Q 2017. The development is located adjacent to Dallas Love Field Airport and will feature more than 1,900 parking spaces as well as a 400-foot-long elevated pedestrian safety bridge. ​​​Want more data? See DFW Office Market Research.